For suggestions of several colleagues this new project allows also to handle micro DDS, switched bandpass filters and / or the IF filters of a transceiver. Just as in the original design the oscillator is based on a plate with the AD9850 DDS from Analog Divice of which are available in the online sales portal www.ebay.com. The oscillator is designed to be used as RF generator 0 to 40Mhz or a VFO for a transceiver, considering conversion to IF and offset SSB or CW. NOTE: To download the .HEX file in a folder, click with right mouse button on "FIRMWARE OF MICRO" and when deployed the window, choose "SAVE LINK AS ....". Then the .HEX file shall be saved in the selected folder. The friend Yani (YB8EXL) has shared his development of PCB. I create a PDF file that I believe is in 1:1 scale. Please before making the board, check the dimensions. To download the PDF click HERE. Thanks Yani for your contribution!! Will you prepare a PCB and share the layout later? The output of shift register 74HC595 may not be sufficient to drive relays and Diodes , so it can be done with Darlington buffer chips like the ULN2803 but it will have a voltage drop of over 1 volt. The output from Shift Register is used to switch transistors with 13.8V on Collector is a better option for LSB/USB and Bandpass Filter Switching . Can I have a copy of your PCB. Hi Waldek, possibly later add the RIT function, yet I do not have much time. for new version with support RIT. Hi Waldek, this microprocessor haven't ADC for add a S-meter. At the moment I will not add. 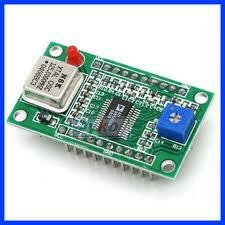 Hi Felipe, i have inserted over tge pcb a little modify for interfacing direct with the relay , i want to send this modification to you. Thanks for sharing this very good project.Could you take account these questions? 1)Cursor can be moved left 4 times at IF section, this can be applied for all? This modification will improve the adjustment much easer. 2)For my application, 40 and 80 m band seem normal. RF outputs are normal. But the rest bands 94.967.295 Hz shown on the LCD and no RF output occurred.What can be wrong here? Hi Coskun, apparently you have a corrupt data stored in the EEPROM of the microcontroller. I recommend resetting the device. To do this turn on the DDS while press the key of STEP / CONFIGURATION. If the problem persists, you may have a problem in the EEPROM of microcontroller. On the issue of cursor'll see if I can change it. Soy Eduardo - EA7MG de Sevilla. Te paso mi direccion de correo para que por favor, me envíes la PCB. Witam, mam pytanie? Czy możesz opisać wyjścia z układów 74HC595 jak i co podłączyć, bo skróty rozumiem ale nie wiem co one sterują? Czy przekaźniki? Np. TX czy ma załączać stopień mocy czy przełączać na część nadawczą urządzenia? Pytam bo mam zrobionego DDS'a, działa ale jak go dalej podłączyć chodzi o te wyjścia. Hello Piotr, 74HC595 outputs are generic, can be adapted to the needs of your project. For example the exit "160m" can be used to bias a NPN transistor for drive a relay and switch the filter input / output of a transceiver. The LSB or USB output can switch between a BFO and another to select the sidebands. The outputs are TTL logic levels ("zero"=0V and "one"=+5 V) and deliver low current, at most can drive a LED, so you have to buffering. I have made this version DDS/VFO board for use to testing receivers, trx, SDR receivers which I home made. One of mode which I have use is Generator mode and it will be nice have to when we switch to "GEN" mode software automatic switch to TX mode because when we have GEN mode it is not working generator if I am not switch manually to TX. It maybe will be nice to have one more in setup option "SDR" and define to display correct frequency when we use this module to as Local Oscillator where board derive frequency to SDR receiver which on SDR board is divided by /2 /4 /8 /16. When we in setup in "SDR" option put for example "4" DDS/VFO will derive for example 28400 khz, display on VFO/DDS will be display 7100 kHz. Hi Waldek, I will take your suggestions for future modifications. Is there an ASM file? Would like band selection up and down install. Nice project, congratulations! The ASM source would be useful to have. For example I need only the 160m-80m-40m bands for my homemade TRX and also can be good to limit the band border frequencies. Saludos desde Mexico, tengo problemas para hacerlo funcionar, solo muestra la frecuencia en el display pero no da salida, ya hice los 2 proyectos y ninguno da salida de rf, tienes alguna idea del por que? Hola, si estas en modo GEN tenes que mover la llave a TX. si está en en RX el módulo queda en stand by. It supports at least 10 different types of LCD including GLCD and keypad, CAT interface and it is opensource. All the project files are available including precompiled binaries as well as the source code for specific versions. Sorry, only for russian speeking folks. Very nice DDS controller made him the first of the works of emergency in my QRP transceiver. I have used as a base unit, Chinese kit at an affordable price (details on my mail: joe9a2qp@gmail.com) and doing the little QRP very nice and even overlapping bands and fashion works perfectly and overlap the TX / RX in SPLIT mode works perfectly. The entire project is described at: https://plus.google.com/u/0/+JosipBedenicec9A2QP/posts with a small video. Thank LU5DJV on a nice project, but given to another could integrate el.key the microcontroller it would be a little work perfectly. Boa noite, gostaria de saber se este DDS VFO conseguiria alternar as bandas em SDR AVALA 1, se conhecem algum link que possa me direcionar a esta informação ficaria grato. Could you please share the ASM file with me. I Make one and it works very fine on board bingo ssb 40m. 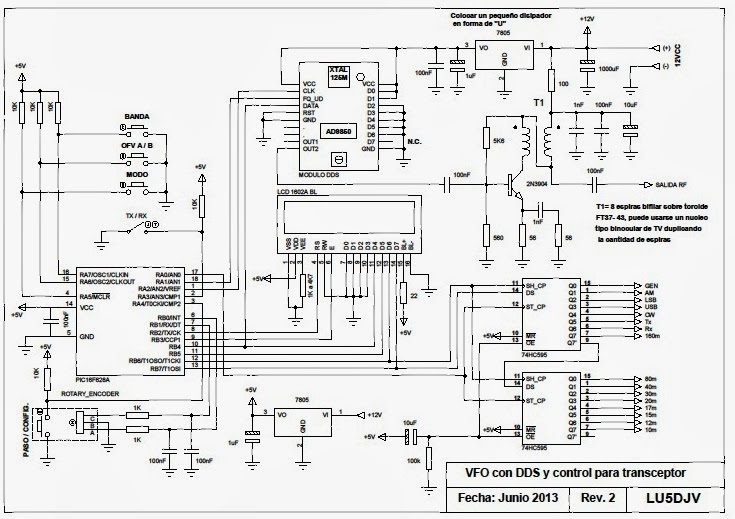 Hola Colega Soy porfesor de radioelectronica y ademas radioaficionado y monte el proyecto diseñado por usted pero los tiempo de las señales de control del dds parece ques muy rapido. si fuera posible mandarme su codigo fuente. Hi Filipe, We have built 3 of your DDS for our club, but when we set "Conversion" for VFO>IF for 40m & 80m,it also makes 20m, 15m 10m VFO>IF - and needs to be VFO<IF. We cannot find out how to program this correctly. Can U help please help. We have looked through the FORUM questions, but cannot find any info about this problem. Hi Bob, unfortunately you can not do that. This project was designed to work with two BFOs one for LSB and another for USB.